Dear, Backers. Thank you for your support and patience! Your financial support during the early development stages was very important for us and motivated us every day. We are working right now on the final prototype, which has the visor with a “combiner” (transparent mirror) in a single piece (the difference between the final variant and current prototype is that the combiner was mounted by mini-columns to the visor, in a similar way to some current “double-glazed”, antifogging “inner visors”). 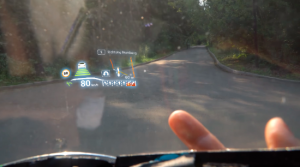 The most challenging part of the whole Livemap project has been to supply a clear, sharp, vivid, yet non-intrusive, image onto the visor – a non-flat surface, in “hostile” environmental conditions! The time, money and effort spent testing and rejecting multiple variants, from different optics designers and specialists has consumed significant resource from our budget. The latest submissions that we have tested have given us the confidence to be able to say that this will be the final prototype and that we will shortly be preparing to move into the production phase. The image is clear and stable. The latest modifications have involved reducing the lens size without compromising image quality. It will be a fully operational prototype with GPS and navigation. We already have the engineering board in our office. “CES 2017 marked the 50th anniversary of the largest global gathering of innovation and showcased the connected future of technology.